Mike, most Corvettes built since 1963 have had a 50/50 weight distribution or even a 49/51 weight distribution since from the 63 on they have all been front mid engine cars (engine behind front axle). 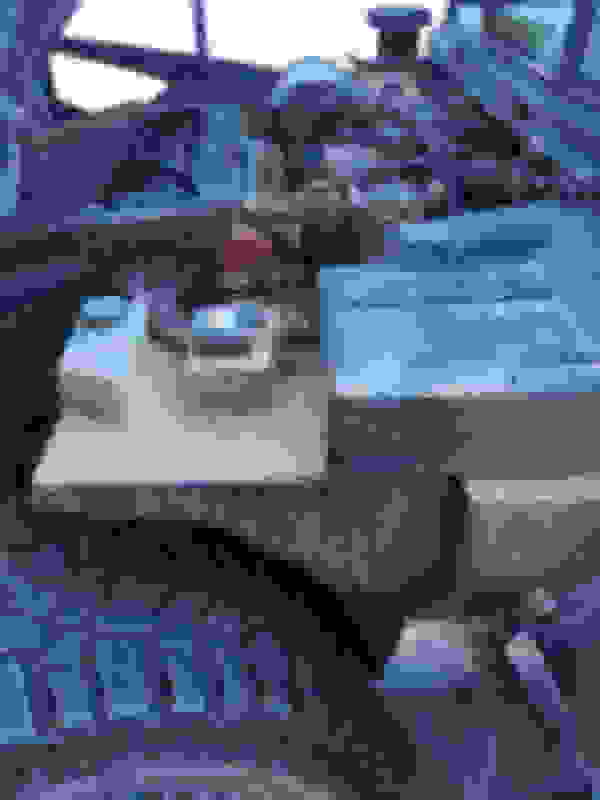 The ones that went to 51/49 ratio were the cars with the big block engine which weighed 150 pounds more than the small block. Check post 10. 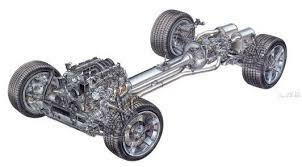 Since the C5, the engine has been placed over the front axle. 1. Us layman are misusing the term "polar moment of inertia", so we should rethink this. 2. When we are discussing a high-performance/racing environment a rigid, well engineered chassis will always handle better than a cheaply engineered, flexible chassis regardless of the location of the mass. That said, given chassis of equally good design, does a mid/rear configuration (where the mass is closer to the CG) have an advantage over a design where the mass is located at each end. In the former case, would you agree that the car is more likely to spin, but also more likely to change direction with less cornering force from the tires? Also, given a very experienced race driver, does this not create an advantage on a road circuit where the car needs to change direction quickly from turn to turn? Right on all counts. 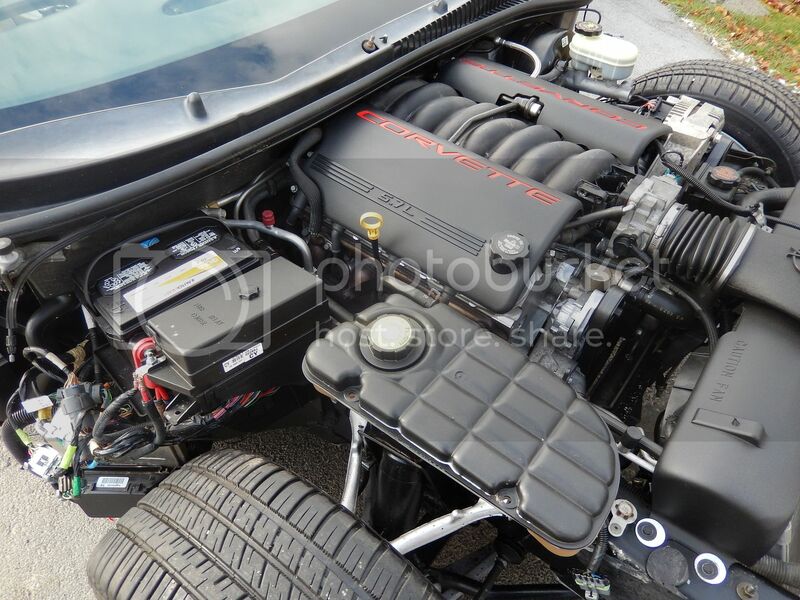 A mid engine sports car is going to be easier to drive than a FE car but it took a hell of a lot of money to beat the push rod engined, leaf spring sprung, cheaply engineered Vette and the Viper around the Ring. The Vette chassis is hardly a cheaply engineered chassis, They are brilliant designs that answer to the stock holder's needs first. The American way. A Miata sells more cars globally but a Vette sells that much locally. The C8 will be no different but I don't think it will go much faster than a C7 around the Ring or where the C7 holds lap records on domestic circuits currently. There will be a direct comparison between these two cheaply engineered flexible chassis pretty soon. A Ferrari is a wonderful car to drive and the first thing you notice is how stiff the chassis feels but the Vette gets the job done almost as well being so damn cheap. The C7 gets it done in a way that is against accepted norms. You use a different yardstick to measure its brilliance. That is the true beauty of the American beast. I'd rather go touring the USA in a FE Vette than a ME one or a Ferrari or a Porsche. Do you know that Red Bull spent more money on designing Loeb's Pikes Peak winning Citroen than both their F1 cars, which would be slower up Pikes Peak anyway. A Hummer and a Unimog are front engined vehicles. A Lexus is much more comfortable because of it's FE V8. Modern cars depend on technology to make them drivable. You can't drive a LaFerrari or a Veyron without their grannies turned on. The C8 is gonna need them but Randy Pabst can drive a ZR1 without them. Um, I'll disagree with that one. I had to replace the front main seal in my C5, and had to do all the work either right on top of or right behind the front axle. Had to pull the steering rack due to interference with the damper. I'm not sure about the C4, but I *know* the C5's engine is behind the front axle. As you can plainly see, since the C5, Corvettes are hardly front ME cars by design. I analyzed this design somewhere in this forum. Check it out. 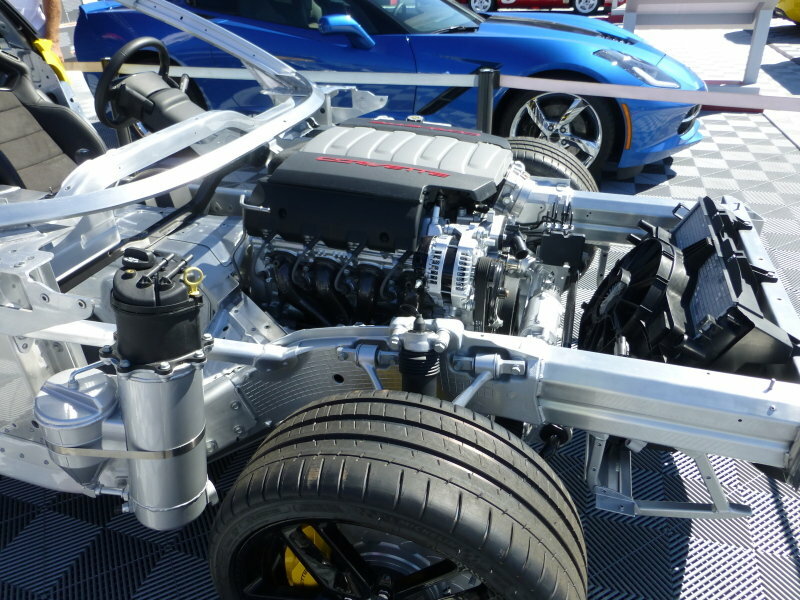 The C7, including the ZR1 have two large mass centroids placed at each end of the chassis where the bending moment is the least. (Allows a lighter structure than ME cars). . The engine is clearly behind the front axle. The C5 and later years are front/midship layouts. This is the first time Ive heard anything close to this, the C5 was supposed to have the stiffest chassis of any production car of its time. Ive never heard anyone refer to a C5 or newer chassis as anything but stiff. "The first structural mode of the ‘C5’ in open roof configuration approaches typical values measured in similar size fixed roof vehicles." Last edited by Clairvoyantwolf; 01-20-2019 at 10:08 PM. Our C7's are practically 50/50 in weight distribution. My question is this, how will the C8 compare to the current GS C7 in handling? The weight (eng on one end, and trans/diff on the other) makes for a vehicle with it's mass on the ends. Great for truck pulls, but not so good for rotating the vehicle around turns. "Mass centralization" is where it's at. Having the engine/trans as close as possible to the midpoint of the wheelbase/track is ideal. In other words... the C8 should be able to out handle the C7. It wouldn't be noticeable in traffic though. Speeds are too slow. Another view. Perform the door gap test. That won't happen on any other modern sports car. Not a bad thing though. Regardless of weight distribution, the C7 GS is very hard to beat in handling. I believe it recorded the highest lateral Gs at the time during testing by C&D or R&T and out dueled the 911 Carrera S in head to head competition. The C7 is one of the best front mid engine, rear wheel drive sports cars ever made when you compare every trim (Stingray, GS, Z06, ZR1) to its respective competition. Not having the engine block up front opens up a world of possibilies regarding suspension design. You can have a double wishbone with push-rod actuated springs and dampers like open wheel cars, and mount all that at or near the centerline of the front wheels thus lowering the front roll center. Something you simply can’t do with an engine in the way. That’s THE biggest handling advantage of a rear midship engine layout. With a lower roll center, lower front center of mass, and a much smaller fulcrum from roll center to CoM, you can virtually eliminate front body roll and still promote efficient and fast side to side weight transfer. Suspension travel, bump, wheel rate, steering rack geometry and everything that makes the front end bite can be improved. 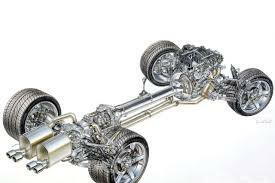 Watch them ditch the leaf spring with the move of the engine behind the driver. i agree it is one of the best but don’t confuse measuring lateral G force with the ability to change direction and balance handling characteristics. The C7 GS definitely feels like it grips for days (moreso than a GT4) but the car does not like to change directions as easily and isn’t as controllable at the limit. That’s what the C8 will add to the already amazing grip of the C7. You're not really serious about this, are you? What a total load of wrot. How many chassis or cars have you designed and built yourself? I love this forum. First, handling has more to do with suspension tuning and tires than configuration. That said, in a racing situation, braking at turn entry, and getting power down early on turn exit are critical, and here is where rear weight bias is a huge advantage. I raced 911s for years. Rear engine layout has been out of favor for decades, but in full race trim, a 911 with its "obsolete" rear engine is just unbeatable in these two areas. A mid/rear configuration combines this rear weight bias advantage with lower rotational momentum. Its no coincidence that virtually every successful race car built since 1964 has a mid/rear engine design. The newer 911 race cars are running mid engine now, I wonder when porche will finaly ditch the back seat and make the 911 mid engine for street too. So, If I take a 5 foot 2x4 and hang a 10 lb weight on each end, hold it at its center of gravity and rotate it, it will tend to continue to rotate until I apply force to stop the rotation... based on my lowly medieval history degree, I'd ball park it at oh, 2.5 feet x 10 lbs of torque or thereabouts. But it will want to continue to spin. Now, if I place those two 10 lb weights right in the middle, and rotate it, it will tend to accelerate and decelerate more easily, as there is less torque on the CG. Is this correct, or am i missing something? I liken it to fighter aircraft. What is optimum for fighters is a platform that is “unstable”. IOW, the platform does not have a tendency one way or the other. And therefore changes in direction occur more quickly and w less input (less steering input). Its likely inaccurate, but I like to think that due to the positioning of the motor in an ME platform, the ability for the vehicle to change direction, quickly, is enhanced.More so than w an FE vehicle. hahahahah it brings joy and pain to me the more time I spend here. Sigh. Only the factory GTLM Cars, 991 cups, FIA GT3s, GTD Car's and PWC are still rear. Last edited by z06801; 01-26-2019 at 12:15 AM. Doubtful Porsche would do this. The rear engined 911 guys are at least as obstinate as the OHV people on this forum. Besides, Porsche has a ME car called the Cayman/Boxster. The balancer on a C4 is midway over the front chassis crossmember and certainly behind the rack.